This book explains why and how companies are using IP Telephony equipment and software to efficiently upgrade existing telephone systems, develop their own advanced communications services, and to more easily integrate telephone network with company information systems. This figure shows how a PBX system can be upgraded to use voice over IP (VoIP) telephone service without any significant changes to the PBX system. 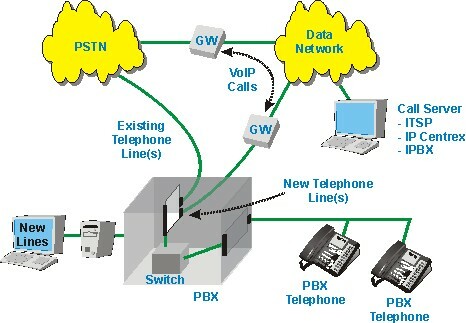 This example shows that a VoIP gateway is used to create addition lines for the PBX system. Because the VoIP gateway can produce standard telephone signals (standard telephone or T1/E1 lines), it can be directly connected to PBX system line cards. The PBX system administrator simply configures the PBX system to use the added lines through the same process that would be used when installing new telephone lines. The gateway is controlled to provide telephone services by a call server from a ITSP, IP Centrex or even another iPBX system. This figure shows the different types of servers used in some IP Telephony communication systems. This example shows that a call manager (proxy server) receives and processes call requests from communication units (IP telephones). The administrator server coordinates accounts to the system. A unit manager (location server) functions as a location server by tracking the IP address assigned to the communication units. 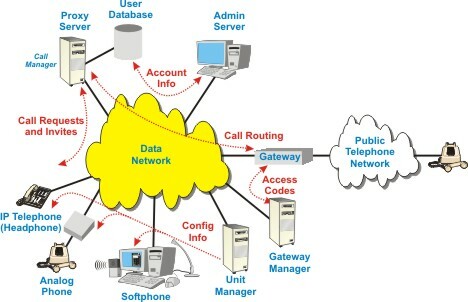 The gateway manager identifies and coordinates communication through the available gateways. The system manager coordinates the communication between the different servers and programs available on the system. 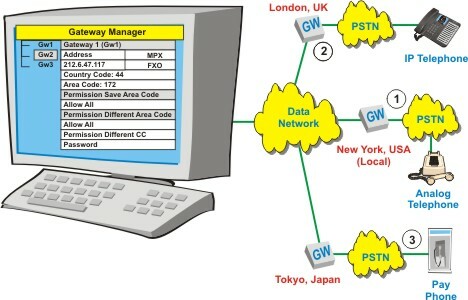 This figure shows how gateway manager software can be used to configure and manage gateways that connect the SIP network to other networks such as the public switched telephone network. This example shows how the gateway manager contains the configuration information for the gateway including IP address, capabilities such as speech coders, protocols, and access control information. Mr. Bowler is an independent telecommunications training consultant. He has almost 20 years experience in designing and delivering training in the areas of wireless networks and related technologies, including CDMA, TDMA, GSM and 3G systems. He also has expertise in Wireless Local Loop and microwave radio systems and has designed and delivered a range of training courses on SS7 and other network signaling protocols. Mr. Bowler has worked for a number of telecommunications operators including Cable and Wireless and Mercury Communications and also for Wray Castle a telecommunications training company where he was responsible for the design of training programmes for delivery on a global basis. Mr. Bowler was educated in the United Kingdom and holds a series of specialized maritime electronic engineering certificates. Robert T. Flood has had a distinguished 30-year career in the telecommunications industry. As a renowned speaker at forums around the globe, Robert is a noted authority on Internet Protocol (IP) telephony. Prior to co-founding PingTone Communications, a provider of managed IPT services to corporations and business users worldwide, Robert was the chief technology officer of Cable & Wireless Global, managing a $3 billion capital budget and 1,500 employees worldwide. Robert was previously the chief technology officer and senior vice president of engineering for ICG Communications, driving the Denver-based telecommunications company into 83 markets. At ICG Flood pioneered Voice over Internet Protocol (IP), covering 188 long distance markets within an 8-month period. Prior to that, he worked for CenTel for 19 years in senior engineering positions. Robert serves on the Board of Directors of several technology companies. He earned a bachelor�s degree in Economics from the University of Nebraska, completed the executive program at the J.L. Kellogg Graduate School of Management at Northwestern University, and has a master�s degree in Economics from the University of Nevada Las Vegas. IP telephony technology has become a reliable communication option that has well-established standardized communication protocol. IP Telephony systems have many low cost devices and software application development tools available compared to proprietary telephone systems and services. The use of IP Telephony products and software allows companies to cost-effectively upgrade and eventually replace existing (legacy) telephone systems with more cost effective and easy to use telephone equipment. Because IP Telephony systems commonly use standardized protocols, this allows end-users and system administrators to have more control and even develop communication services (such as smart voice mail) that have been traditionally been unchangeable and limited. IP Telephony commonly uses text-based protocol (similar to web HTML) and this allows for relatively easy development and integration with existing company information systems to produce new revenue producing services (such as integrating telephone and order processing systems).